I have been yearning for this jacket for months now – you saw me post about it here on my wishlist, and thanks to SCOOP NYC I’m now the proud owner of said jacket! This Helmut Lang bomber is quite a bit heavier than it looks, which I totally appreciate given the cooler temps Dallas has been experiencing these last few weeks. It’s much more luxurious and elevated than other bomber jackets – the color combo is classic, but there is a subtle sheen to the grey sections on the piece, taking it up a notch. It’s the perfect piece for work-to-weekend, because you can wear it with literally anything (and it’s superbly comfortable). Check back on Wednesday for another way to style this chic and easy jacket. On another note, I’ve lately been on the hunt for a new bag – specifically a basic black Chanel with gold hardware (similar to the one I’m carrying in this outfit post). I’m partial to the caviar leather since it wears better and tends to last longer. I’m open to different sizes and silhouettes, but would love my next Chanel to be a vintage find. When searching for a high-quality vintage bag, I use Portero‘s Find It For Me service. This seamless tool makes looking for the perfect bag effortless for you. All you do is click here, fill out the form with the brand, style, color, material, etc of the item you’re looking for, and Portero’s personal shoppers will begin searching for your most-wanted item. Click here to learn more about Find It For Me and begin your search for the perfect vintage designer bag, watch, or piece of jewelry today! Also be sure to check out their current selection of bags and other pieces by Hermès, Chanel, Louis Vuitton and more! This post was sponsored by Portero, but all thoughts and opinions are my own! Thanks for supporting brands that make The Style Scribe possible. I can so why you were on the hunt! Love this jacket!! This jacket is perfection and most of all love the skirt. Perfect outfit! So cute Merritt! That skirt looks super comfy! Isn’t it the best feeling when you finally get something you’ve been searching for forever?! Love this jacket and totally agree that it’s incredibly versatile. Looking lovely as always! this helmut lang is so much cuter on you than it is the hanger!!! Nice bomber! I’m with you on the Chanel bag…I want to find a vintage find that I can have for years to come. Love that jacket and love that skirt, I need to invest in a nice wool gray skirt. Simply beautiful. I love the grey skirt and bag, also your heels are gorgeous. That T-Wang skirt is everything! 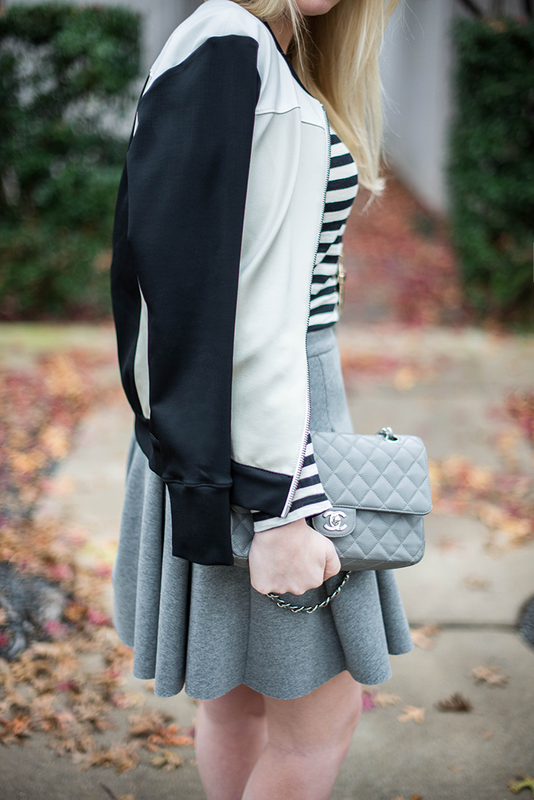 love the stripes and that Chanel purse! I asked Santa for one…. It’s so satisfying when you’re able to purchase something that you’ve been eyeing for a while! That jacket is pretty great and I am in love with your pleated skirt. This skirt is AMAZING!! I love it so much, might have to add it to my Christmas list! Love the bag! It’s a classic. SUCH a cute look – that jacket! !